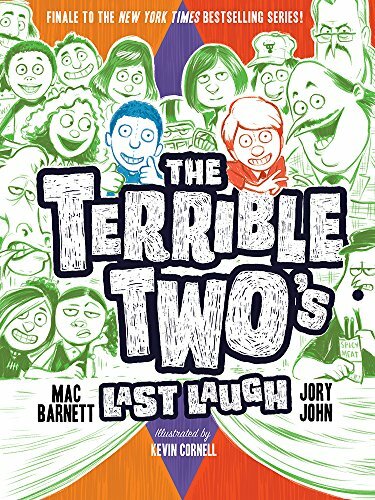 In this grand finale to the Terrible Two series, it’s Miles’ and Niles’ last year at Yawnee Valley Science and Letters Academy, and the Terrible Two have one goal: pulling off an epic prank. They want to make it something for the record books, something that will last as their legacy. At first glance, all should be smooth sailing for these master pranksters. Their nemesis, Principal Barry Barkin, has become a convert to pranking. In fact, he even considers himself a PP, or Pranking Principal, although he still has much to learn. And The Terrible Two have got the school wired. Or so they think. Then, disaster strikes. Miles and Niles learn that their principal’s mean father, Bertrand Barkin, has become Acting Superintendent, and has dedicated himself to exacting revenge on the Terrible Two. Throughout, Cornell’s wacky illustrations add an extra dimension to the story, providing a lively counterpoint to the text and engaging reluctant readers. The Terrible Two’s pranks, like painting polka dots on cows and leaving crop circles to suggest that aliens did it, and locking a bully’s Levis with a padlock, are just as off-the-wall as in earlier books. But by the ending, this book also strikes a sweet and wistful note, focusing on true friendship and how it endures through life’s changes. All in all, a fitting farewell for the Terrible Two.